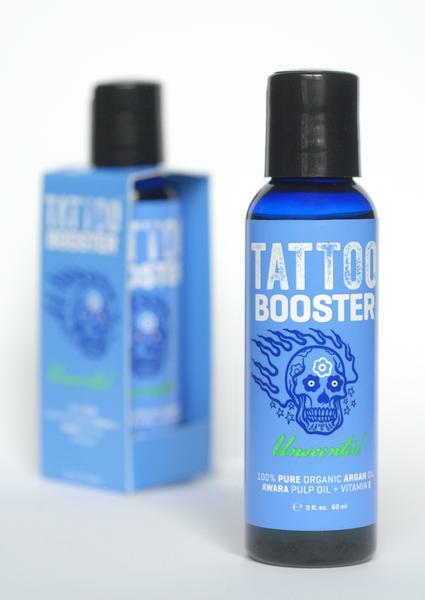 TATTOO BOOSTER® is an organic moisturizer to help maintain and revitalize healed tattooed skin on a daily basis. Our unique formula makes skin and tattoo look vibrant and lustrous without leaving an oily residue. Argan Oil – grown and harvested by north-African Berbers, a moisturizer that alleviate skin dryness and dullness.100% organic certified. Vitamin E – nourishing vitamin with essential fatty acids. Awara Oil – from the Amazon basin, a natural source of antioxidants, b-carotene and vitamin A, a natural sunscreen. Available as Unscented formula and with a sensual scent: Fruit of Desire. All skin types. Not recommended for ultra-sensitive skin. Rub small amount in palm of hand and apply to healed skin.